Still Texting? OMG, That's Already So Old-School : All Tech Considered A new report says instant messaging is surpassing old-fashioned texting in Britain. It may seem too soon to talk about the good old days of texting, but technological turnover is another sign of the times. Also on the decline: phone numbers. A new report says old-fashioned texting is on the decline in Britain. For the first time ever, traditional texting — the kind you do through your cell phone provider — has dropped in Britain. That's according to the annual technology predictions report from Deloitte, which reported that the number of text messages passed around by Brits decreased by 7 billion last year. Instead, the company predicts, people in the U.K. will send around 300 billion instant messages in 2014. That's the kind of messaging that requires an app and uses the Internet. Old-fashioned texting is only expected to account for about 140 billion messages. 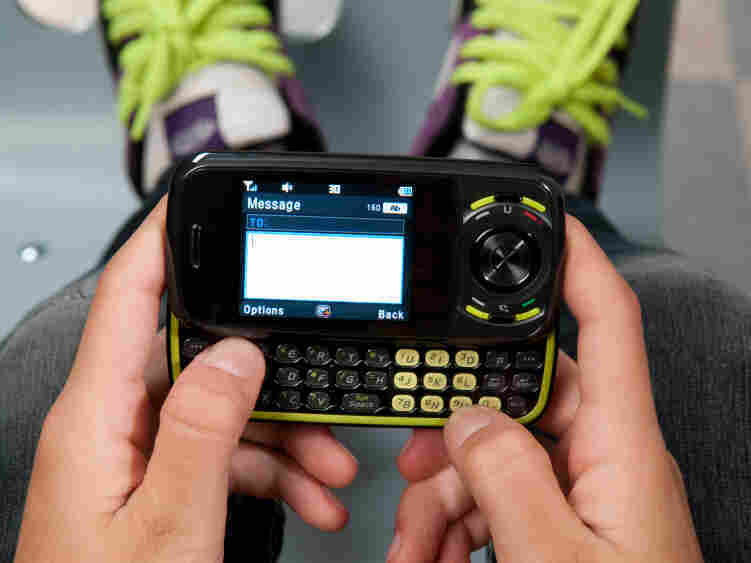 You pay for texts: With a texting plan from your cell phone provider, you usually pay to send text messages. With instant messaging services, including Facebook, Snapchat and WhatsApp, the app is free. You pay for a data plan — your access to the Internet — but you're not billed for your messages. You can do more with instant messages: For example, you can set a time limit for how long messages on Snapchat can be seen; you can send audio or video clips with WhatsApp. You don't have to worry about phone numbers: Most apps don't need them. "That's a nice thing about where this is all moving, the intersection of social and mobile," Richard says. "You can fire up an app, connect it to your Facebook, and all of a sudden you're able to pull in all of your contacts from Facebook and you never have to worry about the phone number." Where young people go, their elders will follow: The report also predicts that people over 55 will be buying smart phones at the quickest rate this year. Richard says that will drive even more people to instant messaging. "Remember, if their kids are there and they want to be connecting with their kid, they're going to have to be on the platform to send them that message, like, 'Hey, come home, dinner's ready,' " he says. It may seem too soon to talk about the good old days of texting, but technological turnover is another sign of the times. "Texting really is just about a 20-year-old technology, and we're talking about it declining already," Richard says. "These are sort of the cycles that we're seeing in technology development."